Making the Fast Car Faster with a Wilwood Big Brake System! Edik Stepanyan's Integra was already one of the fastest cars in the MPTCC series. To make matters worse for his competitors Edik has been hard at work during the off season dialing in the car specifically for MPTCC rules. In the previous year Edik's car was set up for NASA's H2 class which meant his car was not built to the full extent that the MPTCC's rules allow. Edik has been busy optimizing his powerband for the MPTCC's power to weight limit and improving his braking. 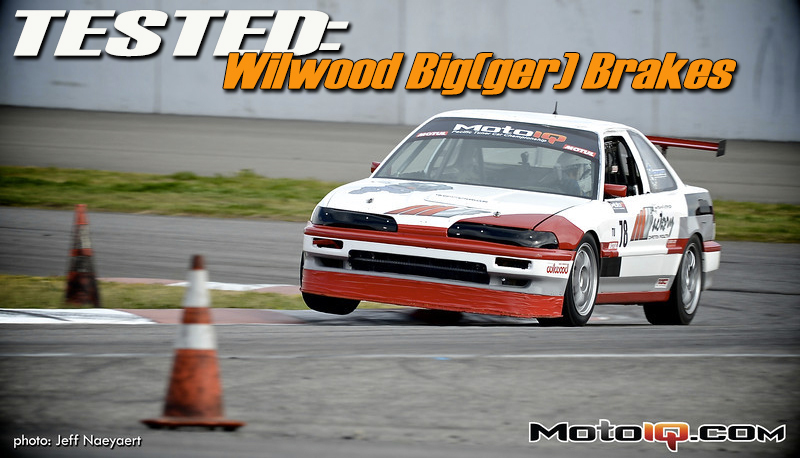 Edik's car has always been known to be one of the best handling cars in the field but he found that with the car's new power and large 245 tires, that his old Wilwood big brake kit was inadequate. His old big brake kit, although much better than the stock Integra brakes, was experiencing high pedal effort and rapid pad wear with the speed and grip his new larger tires were providing. To bring his brakes up to snuff for the 2013 season, Edik turned again to Wilwood to get his braking system in line with the capabilities of the rest of his car. Although Edik had a Wilwood big brake system, his car is one of the fastest road race Integras in the country and was needing more brake. 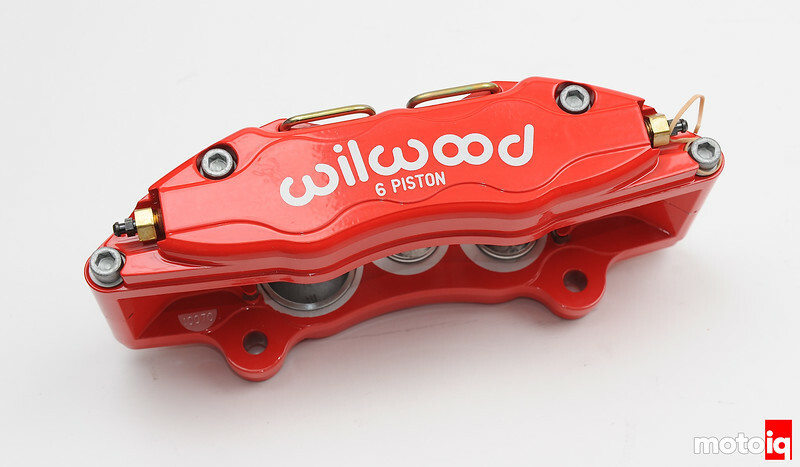 Wilwood answered his needs with a bigger brake system. His old system used 4 piston Dynalite Calipers with 11.75″ rotors. The new brake system features six piston Dynapro calipers and 12.2″ diameter two piece rotors. 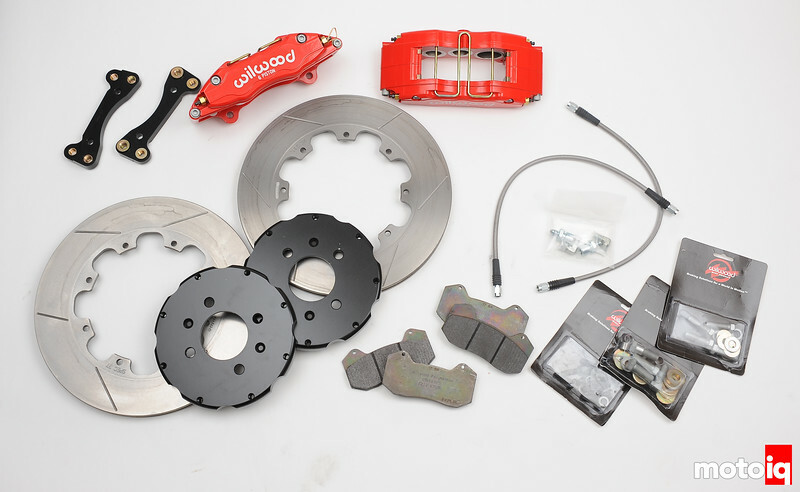 The kit comes with calipers, brackets, rotors, alloy hats, DOT approved stainless steel brake lines, Polymatrix B brake pads and all of the correct hardware for an easy installation. The Dynapro caliper is much larger than the Dynalite caliper it replaces. The brake pad is much longer at 4.75″ vs the Dynalite 4 inches which means 6.36 square inches of pad area vs 7.30 square inches for the new calipers. The Dynapro calipers have a stiff forged alloy body to help ensure a hard pedal. The Dynapro calipers also have staggered piston diameters to help prevent taper wear of the brake pads. 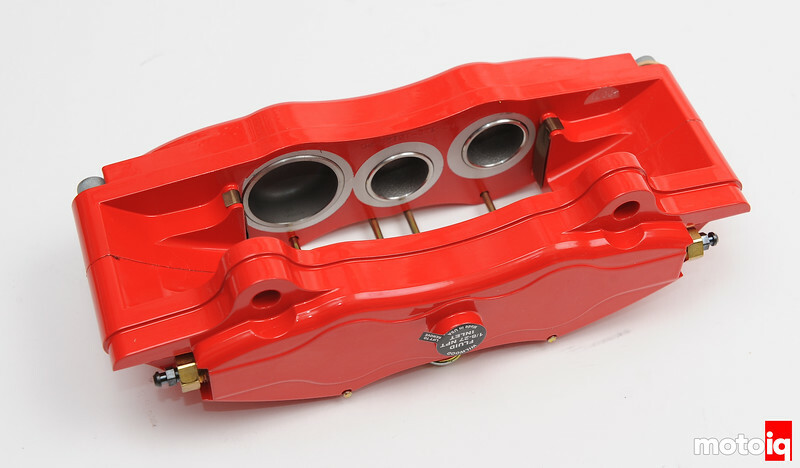 Brake pads will wear about 30% faster on the leading edge and putting a smaller front piston progressing to the larger rear piston will eliminate this enabling you to get more wear from your pads. The pistons are also sized to provide good proportioning with the stock master cylinder. Note the stainless steel abutments where the brake pad backing plates contact the caliper body. This is to prevent the backing plate from wearing a groove in the aluminum caliper body which would cause irregular braking and sticking of the pedal. The new rotors are an upgrade from the 11.75″ diameter straight vane rotors previously run to Wilwood's 12.2″ directional curved vane GT rotors. The 36 curved vanes pump more air through the rotor's interior and offer greater internal area for greater heat dissipation. The larger diameter of the rotor produces 2% more brake torque. The GT rotors are made of Wilwood's proprietary Spec 37 material which has a consistent coefficient of friction across a wide heat range and is dimensionally stable at high temperatures as well as long wearing. The alloy hats are shaped to help direct more air to the vanes to further help dissipate heat. Although heavier than the previous 11.75″ two piece rotor, the new larger rotor is still much lighter than the stock iron rotor.